Dashboard is a default page you see after you log in. It is an adjustable view that may contain many types of information blocks (widgets), such as today’s calendar, recent calls and emails, quick launchpad, etc. You can have several dashboards that serve different purposes and switch between them. In this section you will learn how to easily customize existing dashboard or create a new one, as well as add and manage widgets in the Oro application. 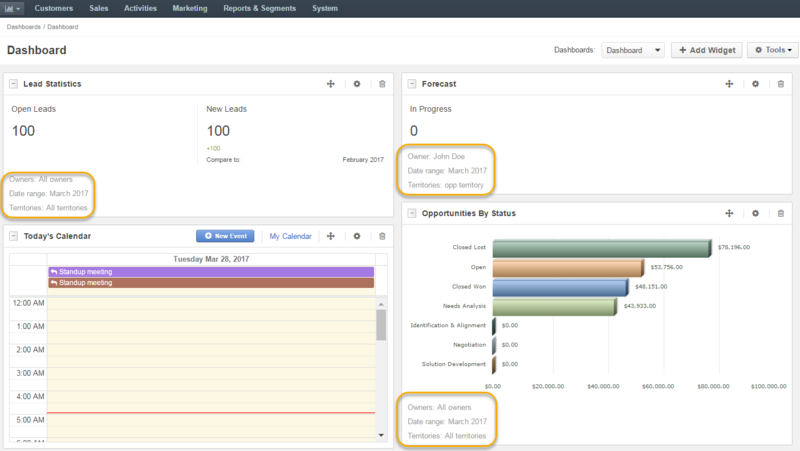 Hover over the in the main menu and click Manage Dashboards. Click Create Dashboard on the top right of the page. Label Name used to refer to the dashboard in the system. Clone from Choose an existing dashboard to be used as a base for a new one. If you want to create a dashboard from the scratch, choose the Blank Dashboard option. To save the dashboard, click Save and Close on the top right. Initially, the dashboard contains all the widgets of the dashboard it has been cloned from. Dashboards cloned from the Blank Dashboard will be empty. Hover over the in the main menu and click the dashboard name. 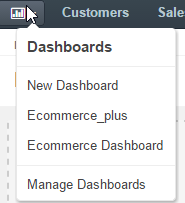 Toggle dashboards in the header of the Dashboard page. Additional widgets can be added via a third-party system integrations. Navigate to the dashboard (e.g. hover over the in the main menu and click the dashboard name). The page that appears lists all the widgets available in the system which have not been added to the dashboard yet. To search for a widget, type its name in the search field. Select the widget that you would like to add and click Add. This way you can add the same widgets a number of times and assign them different owners. You can add the same widgets a number of times and assign them different owners. Widgets can be easily managed and filtered. A number of widgets can be created for various team members. For instance, a sales manager can create the same widgets for each sales rep within the organization to be able to see results of each sales rep’s work. The Collapse/ Expand button — If a widget has been collapsed, only its header will be displayed on the dashboard. Widget name — Widget title displayed on the dashboard. The Move button — Click and hold the button while moving the widget around the dashboard. The Settings button — Click the button to adjust the widget. See the Adjust Widget Settings section for the options you can change. Widget title — the name displayed on the dashboard. Date range — time for which the widget details are displayed. Compare with previous period — tick this option if you wish to compare statistics for the current and the previous periods and see it displayed in the dashboard widget. Other widget details (depending on widget type). Click to edit the dashboard. Click to create a new dashboard. Click to delete the dashboard from the system. You can also perform these actions via the More Options menu from the Dashboards list page (Dashboards > Manage Dashboards in the main menu).